Do you love the thought of the future on Mars? If so zoom on down to Escape Rooms in Angels. They have two rooms in total Project D.I.V.A. and The Dark Side. We had the pleasure of playing Project D.I.V.A.. Escape Rooms can also be found in London Bridge with a number of other different escape rooms. It’s the year 2038 and we have been transported to Mars. However the ER-27 defence and research stations that is orbiting Mars, went totally silent. D.I.V.A (Defence Interactive Virtual Assistant) sent a cryptic message warning of immediate death to all humanity. It was up to us agents to intercept ER-27, get on board and destroy D.I.V.A and regain control of the station by infiltrating her core and removing her 4 hard drives to disable her then use them to reboot the system . The future of humanity depended on us agents. 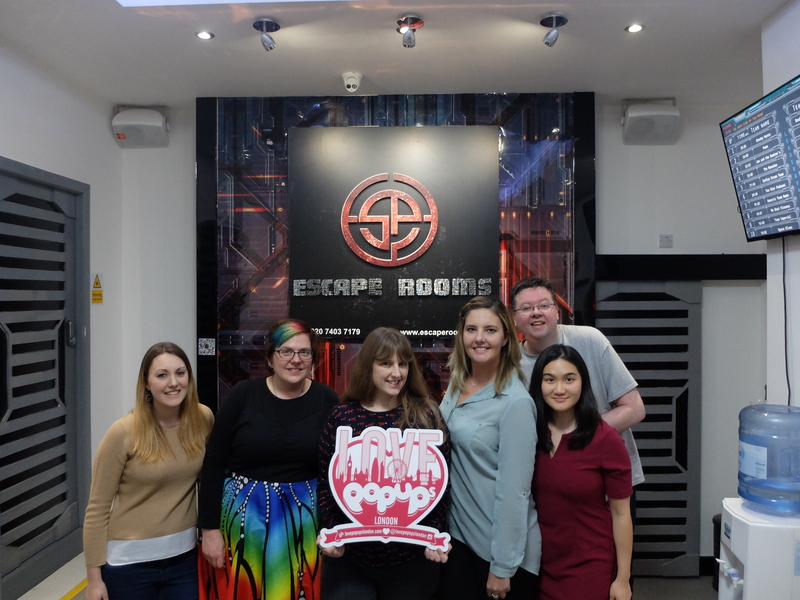 Thanks to Escape Rooms London who let some of us from Love Pop Ups London community come down to play Project D.I.V.A.. Read all blogs/reviews from the comments section below. Project Diva was a really fun escape room! They took us to mars in a bid to disable an AI. The effects were really good and at times I felt like I was in a movie set. The game is quite linear so there are good opportunities for collaboration. The only thing I would advice is use your phone as a torch as it gets pretty dark in there. The puzzles were quite unique and there are a lot of QR codes (they provide the phones to scan the QR codes) and you get clues via a message on the app. Without giving away too much about the room, this one is really well done! The first room is dark, full of electronic devices and futuristic lighting. It’s unfortunately a bit on the small side with devices on the floor, so not suitable for a wheelchair. The first clues and codes were deciphered quickly and upon solving them, drawers slid out of walls and hidden doors opened. Everything is automated and I absolutely loved it. The riddles and codes all made a certain amount of sense for the setting, the smartphone apps were exciting to work with and it all felt very immersive and interactive. I feel like I’m on a mission to do all the escape rooms in London and I love it. The Year is 2038 and our civilisation is slowly conquering the solar system. The use of Artificial Intelligence is essential in paving our path to other planets and has even enabled us to begin terraforming Mars… This is the theme of this room and it was superbly done. The first thing we are given is iPhone’s to help without mission because it is modern times of course and we would all be lost without our phones and in this case quite literally. Without giving too much away, this high tech-focused room is so well thought out with a bit of crawling, jumping and climbing. Think The Big Bang Theory meets Indiana Jones with lasers. A truly out of this world experience. By far the most interactive escape game I’ve played and a vast improvement on their others at London Bridge which feel a little old and battered. These two new games hidden away in Angel are the polar opposite and embrace the two themes they are based on. We played Project D.I.V.A where our group were sent to Mars 2038 to help regain control of a defense and research station which had been taken over by an A.I, threatening death to mankind. Without giving too much away there is plenty to do for everyone, lots of gadgets and surprises along with a handheld phone for scanning and extra clues. Although I was sceptical about the linear fashion of the game (one clue at a time) it worked really well and meant we worked together as a team the whole way. I loved it! Their other game The Dark Side of the Moon also sounds awesome (you get to use toy guns – whaaaat). Both guys greeting and helping us were lovely and overall it was great fun!